"Will Your Majesty succumb to the enemy king?" Signature Entertainment has released their new official UK trailer for their upcoming release of a Korean action film titled The Fortress. This already opened last year in Korea (and in the US) but is just now getting a UK release this fall. We haven't featured this trailer before, so take a look if it sounds appealing. The Fortress is the newest film from filmmaker Hwang Dong-hyuk (of My Father, Silenced, Miss Granny) set in 1636. The story is set during the Qinq invasion of Korea, when King Injo decides to in the mountains in a fortress to avoid being part of the Qing dynasty. The film stars Park Hae-il as the King, with Lee Byung-Hun, Kim Yoon-Seok, Go Soo, Park Hee-soon, and Jo Woo-jin. It looks like a gripping period piece with some big action as well as smaller intimate moments. During the Qing Invasion of Korea, the king and the court take refuge in a mountain fortress, where they find themselves stranded in the cold and surrounded by the enemy. The king's dilemma deepens as his people in the fortress start dying from cold and hunger. 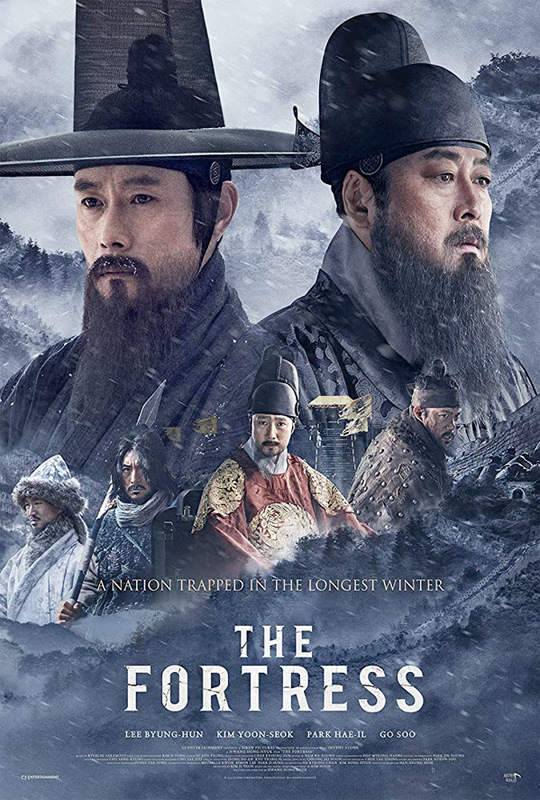 The Fortress, also known as Namhansanseong, is written and directed by Korean filmmaker Hwang Dong-hyuk, director of the films My Father, Silenced, and Miss Granny previously. Based on the novel written by Kim Hoon. This intially opened in Korea first in October last year, and already opened in the US last fall. Signature Entertainment will release The Fortress in UK cinemas starting sometime in the fall, if anyone out there still wants to see this. Maybe? Maybe not?